Shirt - The official Lion t-shirt. Belt - Official navy-blue web belt with metal buckle. Cap - Official navy-blue Lion cap. Neckerchief - (Optional) Lion neckerchief. 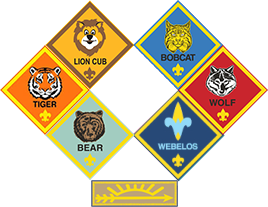 The Lion den decides if they will wear the neckerchief. Neckerchief slide - (Optional) Lion neckerchief slide. To get an idea of pricing, or to order items online, visit scoutstuff.org. This is the official online scout shop. They should have the same prices as our local scout shop. You might contact the Advancement Chair if you need a patch or two. You are also welcome to order any needed items online or however you like.